Trillium is located a 30 minute drive or an hour by public transit in the area of Canton south of Boston. They also have a shop downtown Boston where you can pick up cans to go but can’t taste anything. 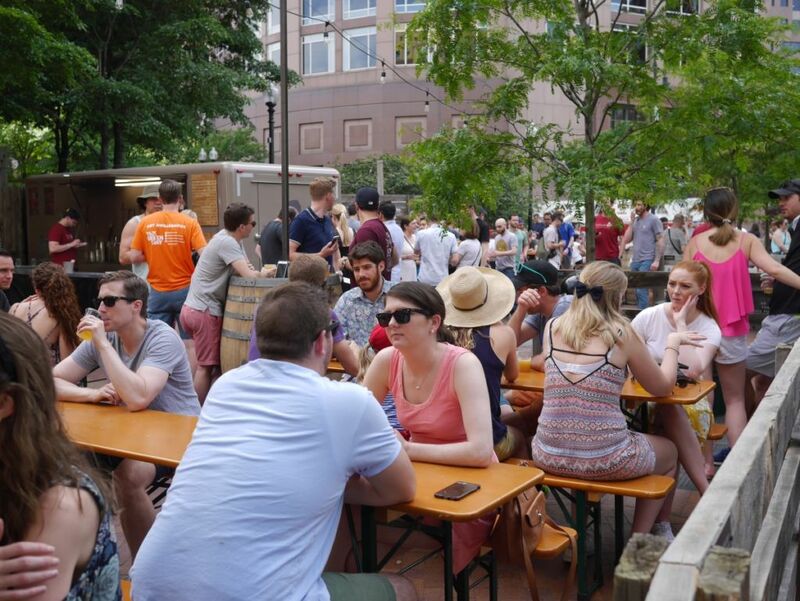 They also have a seasonal beer-garden in downtown Boston where you can order some of their beers in an outdoor setting though they have a more limited tap list than the brewery and everything is served as one size of pour in plastic cups. I’m glad I made the trip to the brewery this time because I got to try a larger number of their beers and determine my favorite to decide which cans to buy. 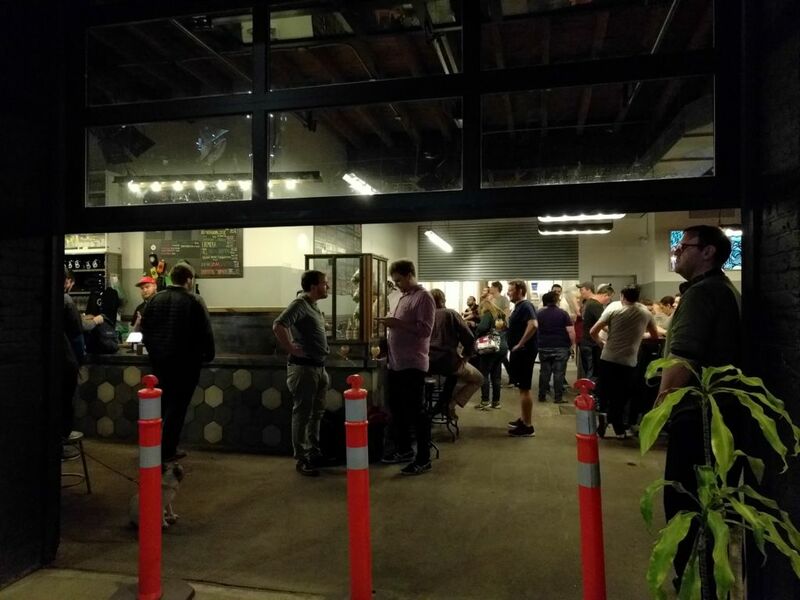 The tap room gets quite crowded and thus quite loud from the noise of people and the music. 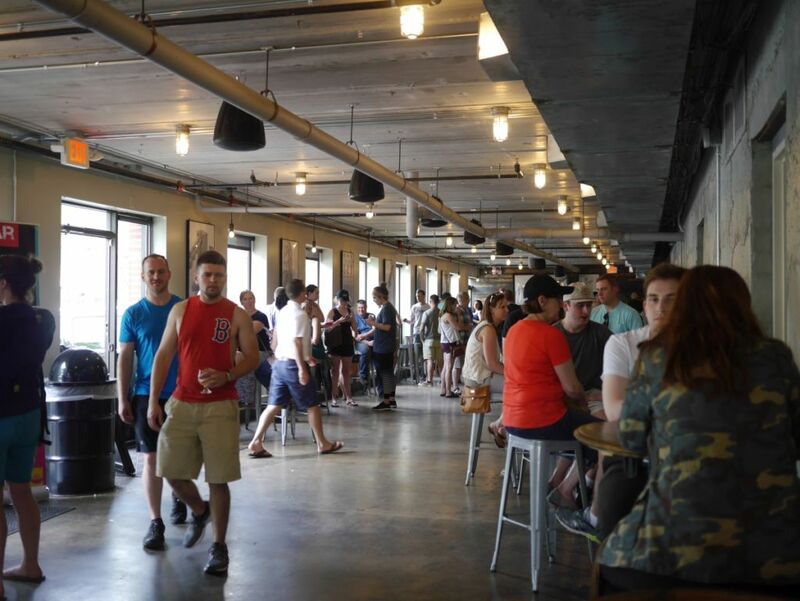 View of the large tap room. I started with the Summer Street and Congress Street hazy IPAs. All the various Street beers are brewed similar but with different hop profiles. Summer Street was tasty with strong tropical fruit character including pineapple, medium hop acidity, and a sticky bitter finish The Congress Street was more mellow with less harsh acidity, a bit softer, sporting notes of papaya and mango with some pine bitterness. The Motueka Free Rise, hoppy saison, was earthy and not very hoppy with a dry finish. It was a pretty average saison and not up to the level of Tired Hands. Melchior Street was my favorite of the streets I tried. It had a fantastic mix of pineapple and pine with mild bitterness and acidity. It was the most balanced of the bunch. Secret Stairs is their 8% alchol stout. It was smoky and roasty with notes of burnt caramel and a medium bitter finish. 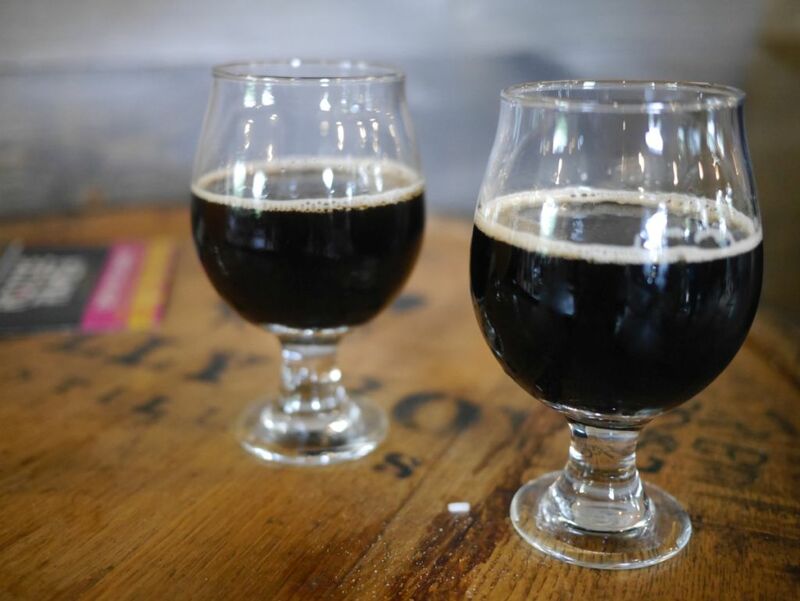 The Night and Day imperial stout with coffee was quite impressive with notes of mild smoke and caramel that blend nicely with strong acidic coffee. I got little noticeable hint of alcohol in the taste. Mettle is the one beer from the bunch I had before. The double IPA had tons of fruit and citrus notes from the hops with a mild acidic finish. It was soft and delicious. I compared this side by side with Uppercase, which was also quite soft with lots of tropical fruit and citrus with a mild acidic finish. Both double IPAs were quite impressive. The Raspberry Soak was a pretty basic fruity light alcohol sour with lots of lactic acid and mild raspberry flavor but little complexity. It is pretty standard for the fruited berliner weisse that most breweries serve these days, tart but boring. 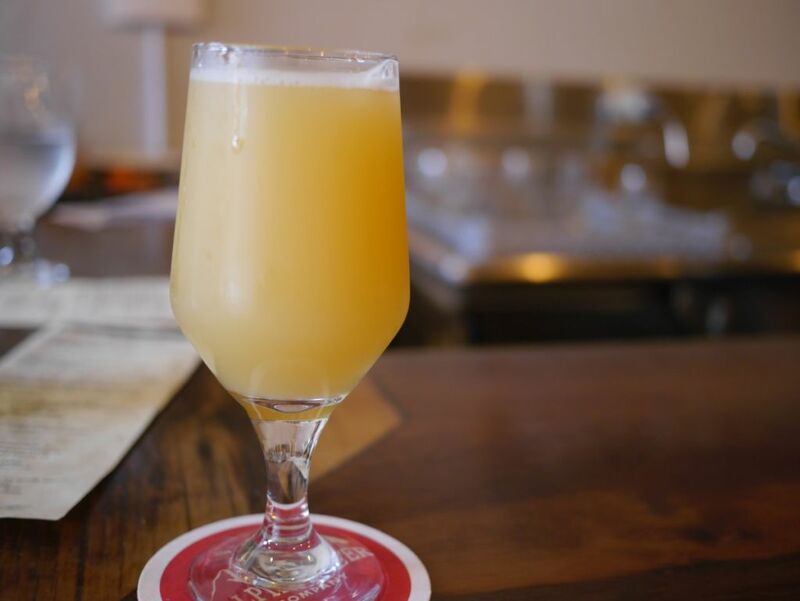 The Permutation 11, barrel aged sour with peaches, was a delightful mix of soft body, sweet peaches, and mild pepper notes. It was a nice middle ground between the highly acidic style that is quite common and the pure fruit juice style I’ve had from others. I probably would have bought some bottles if they were available for a reasonable price. Hazy beer in plastic! Only had one. Though the price of each 5oz pour was high, ranging from $4-5, it is worth going down at least once so that you can try all the beers they have available. Plus they have air conditioning and keep the area at least cooler than outside. Once you discover your favorites, you can easily pick up cans from the shop in Downtown Boston. 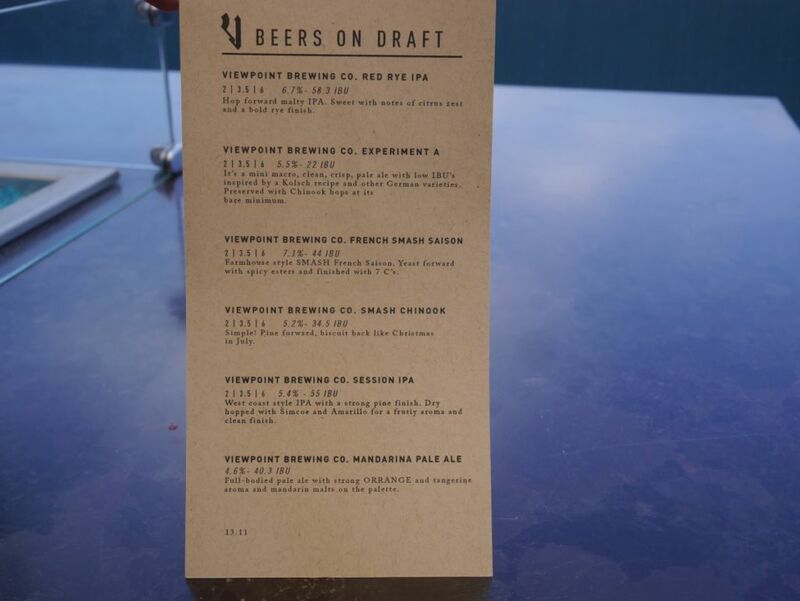 Viewpoint has the distinction as the first brewery to open in Del Mar. 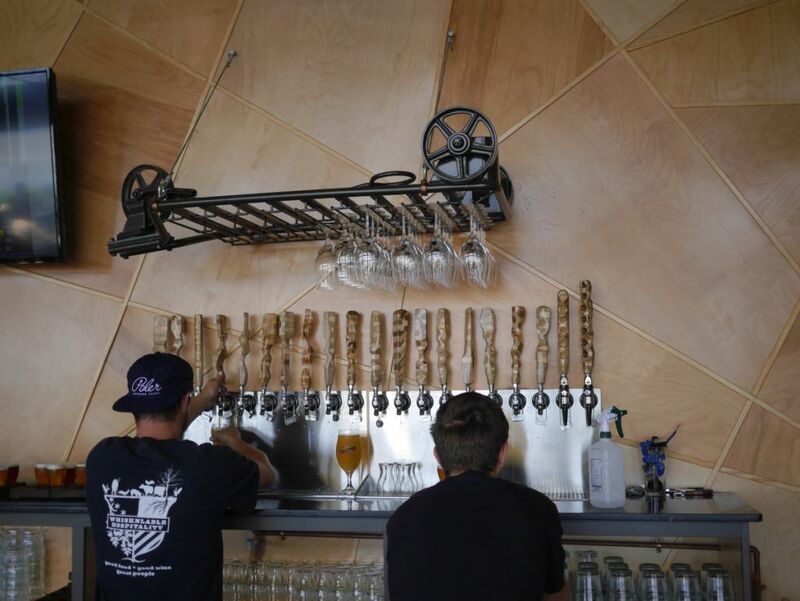 Many in the area resisted the idea of a brewery and tasting room so they made a compromise and exist as a tasting room only until 4PM and then at 5PM they open as a restaurant. 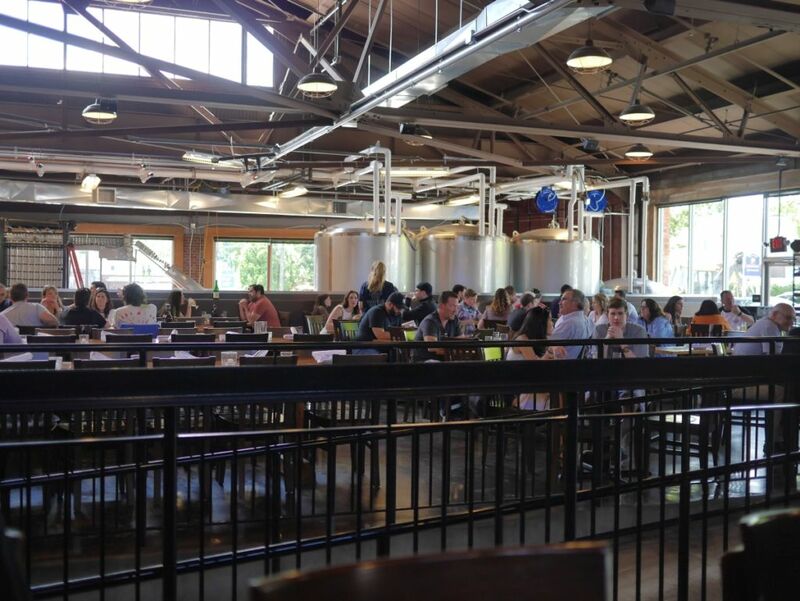 Since even the people of Del Mar drink alcohol with dinner they are satisfied and the brewery gets to open. 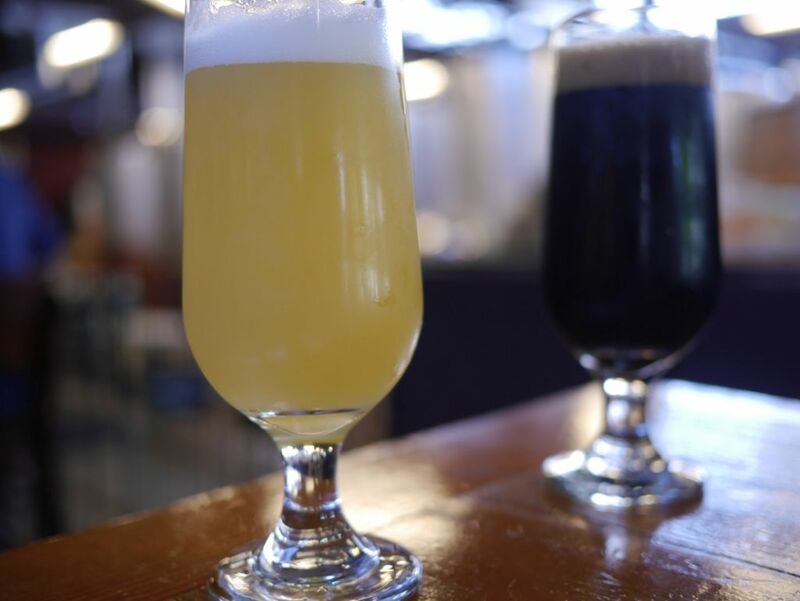 This is a unique thing for a San Diego brewery. I ordered a flight of all their tasters while looking across the water to the racetrack on the other side. The view allowed me to forgive the wait for someone to take my drink order that you get when you aren’t sitting at the bar. 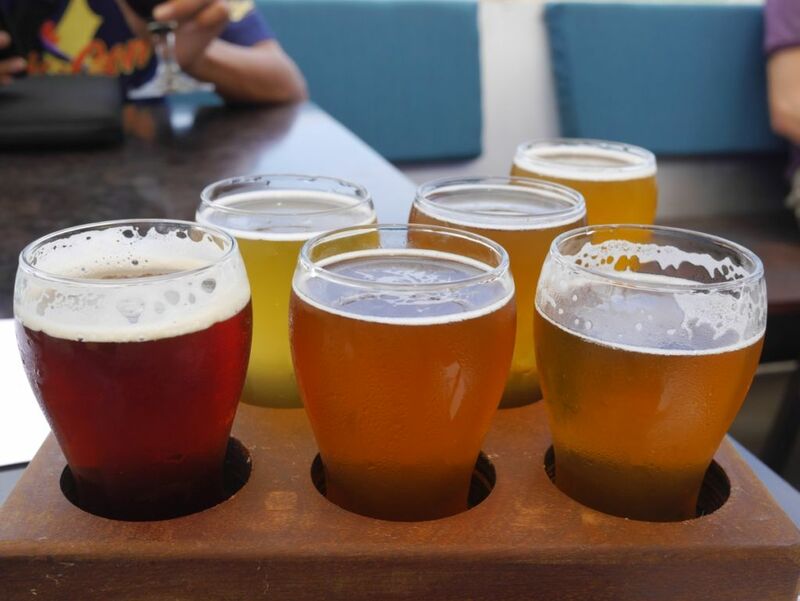 I also recommend you don’t do a flight on a warm day because the beers warm up too quickly and the last quarter of the taster is going to be too hot if you take your time tasting. My husband enjoying the fresh air. 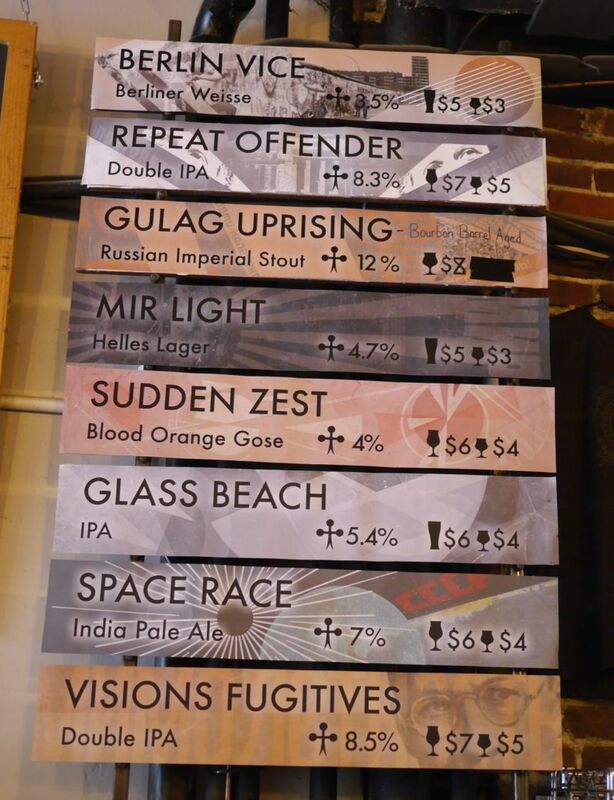 The beers available focused mostly on the hops with three pale ales, a session IPA, a saison, and a red rye IPA. The choice to focus on lower alcohol beers probably has something to do with their location. Experiment A Pale, made with experimental hops, was smooth and balanced with biscuit malt base. It had some mild ester character and a mild bitter finish. Of all the pale ales this one is was the least hoppy. The SMASH Chinook pale had a dank marijuana nose and tons of dank resin and pine on the taste with hints of marijuana. It had a mild sticky body fitting with the resin and a fairly low bitter finish. I enjoyed this one a lot but it is recommended for the big hop heads. 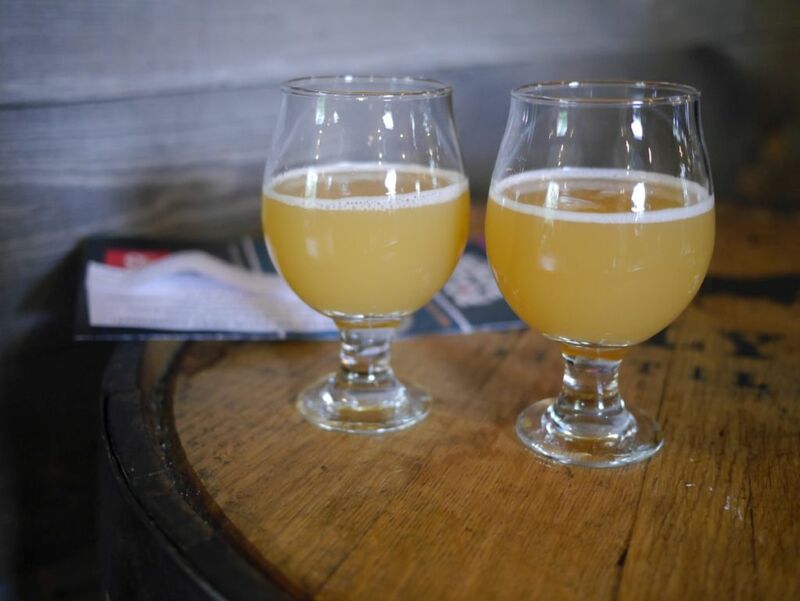 The mandarina pale had notes of tangerine and bitter grapefruit and a stronger bitterness than the other two pales. It had some herbal character as it warmed up. The session IPA was dank and resinous with strong pine on the finish and a medium bitterness. It was slightly darker than the pale ales but not overly malty. 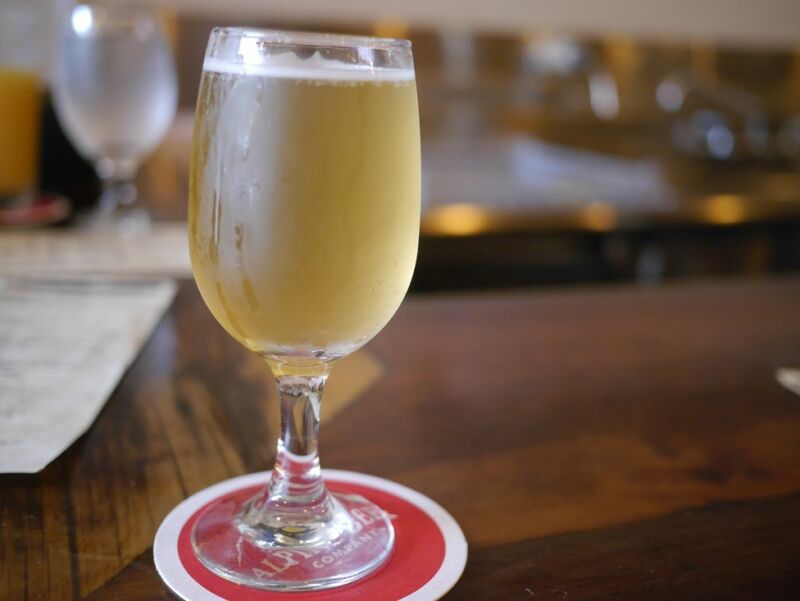 The saison was solid with lots of ester character, notes of vanilla, spice, and white wine. I didn’t get much hop character here even though smash in the name suggests it had some hops added. The red rye IPA was nicely balanced and not too bitter. The beer focuses on classic bittering hops as opposed to aroma and compared to the rest of the beers it seemed out of place. Viewpoint has an open patio mostly covered. If you sit at a table prepare for a slight wait to order beers and get them served. I was slightly disappointed that with so many beers they didn’t have them in an order that suggested tasting order though none of them was so bitter it would wreck your palate. If you aren’t into hoppy beers, they have plenty of guest beers on tap as well from various small local breweries. If you know what you like, I recommend trying a splash and ordering a full pour because they don’t warm up as fast as the tasters. 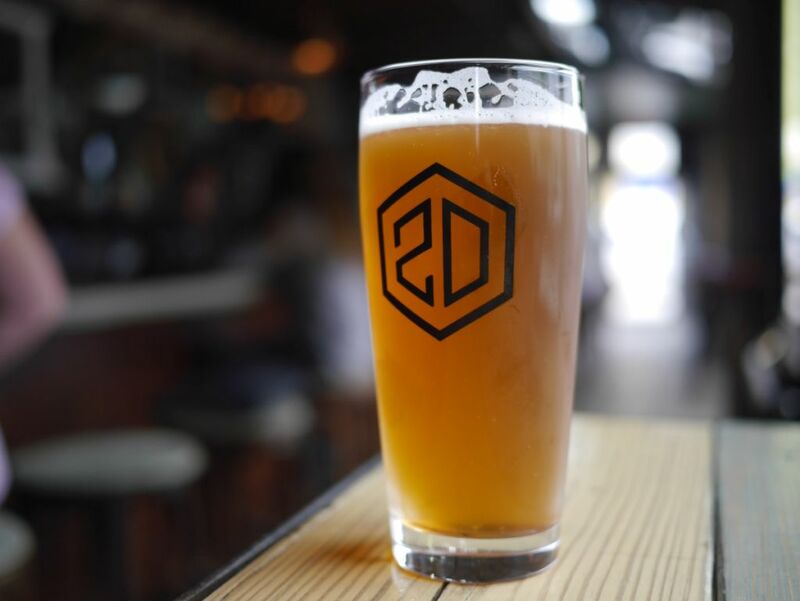 I combined the two breweries into one because I had only one beer at 2nd District. 2nd District is down in an area where you absolutely don’t want to try to park. Then again you are better off not driving at all in Philadelphia if you can help it. We had a car because we decided to stay in Ardmore near Tired Hands. Getting down to 2nd District takes quite some time whether you are driving yourself or riding in an Uber because of some tight streets that move pretty slowly. The view of the building from outside. 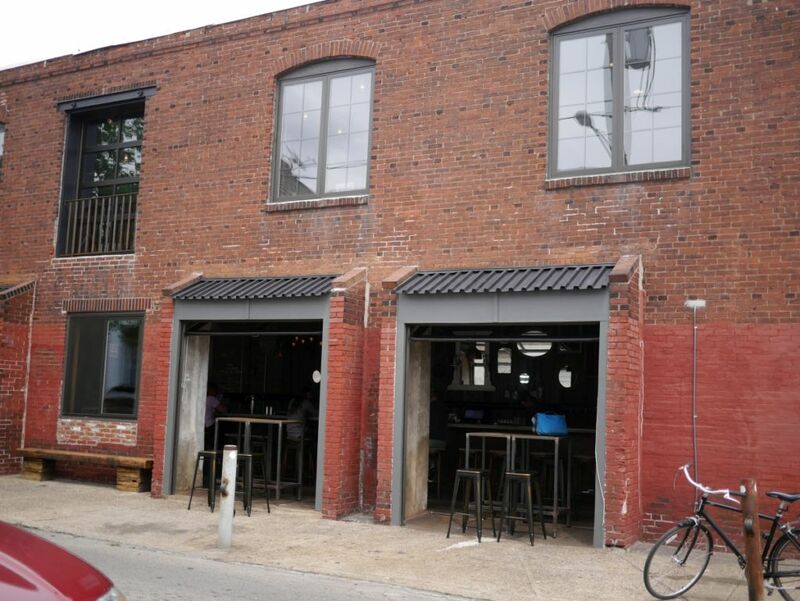 Second District is inside an old brick building. 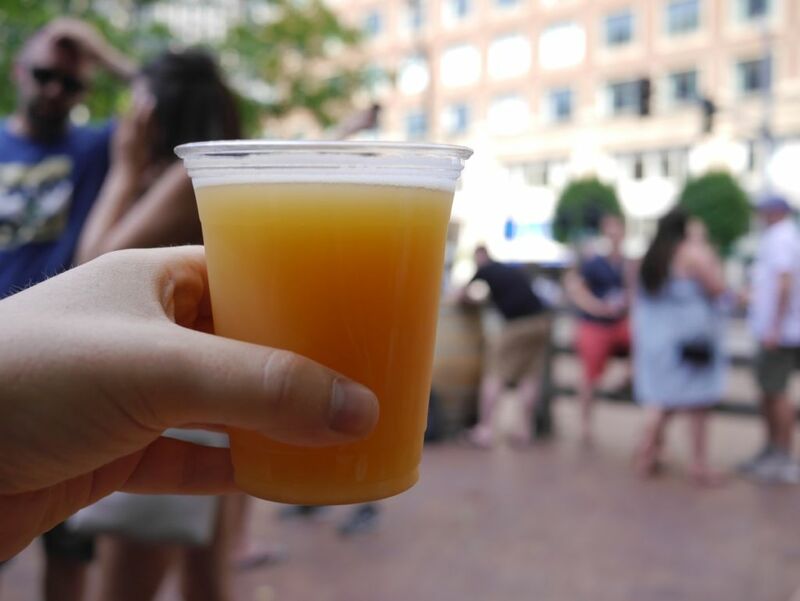 Like other breweries in the area and a lot of New England in general, beers are priced such that it makes a lot more sense to order a larger pour. Thus, I only had one beer at 2nd District and a few sips of my husband’s. 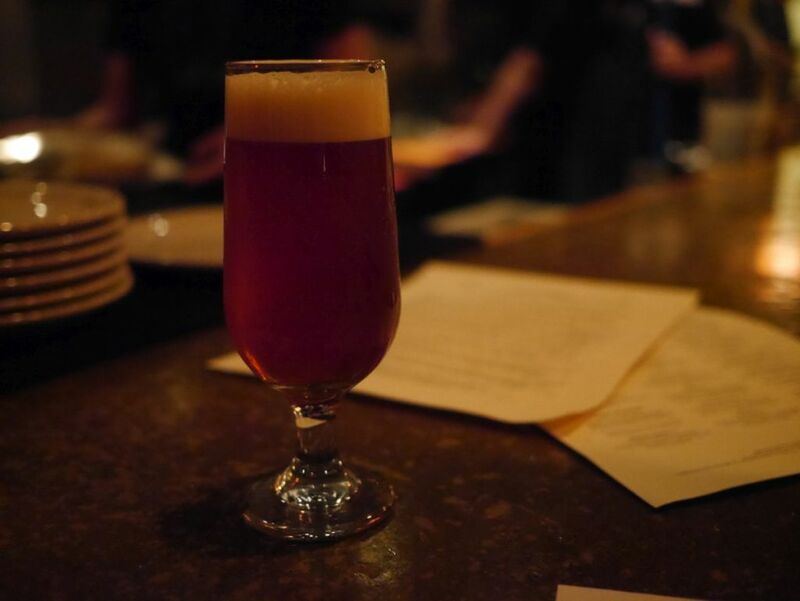 The most interesting beer on the menu was their biere de garde with black pepper called Petite Villain. It was a fantastic complex beer blending spice notes, fruity malts, very mild pepper, and a dry earthy finish. My husband ordered their dry Irish stout and he enjoyed it. It was typical of the style, made smoother on nitro, with good roasty character and a dry finish. I would have liked to have spent more time here but we had to move on to other spots. Second District seemed like a solid brewery. I would recommend taking public transit down there if you are staying downtown. A reminder of the previous occupants of the building. 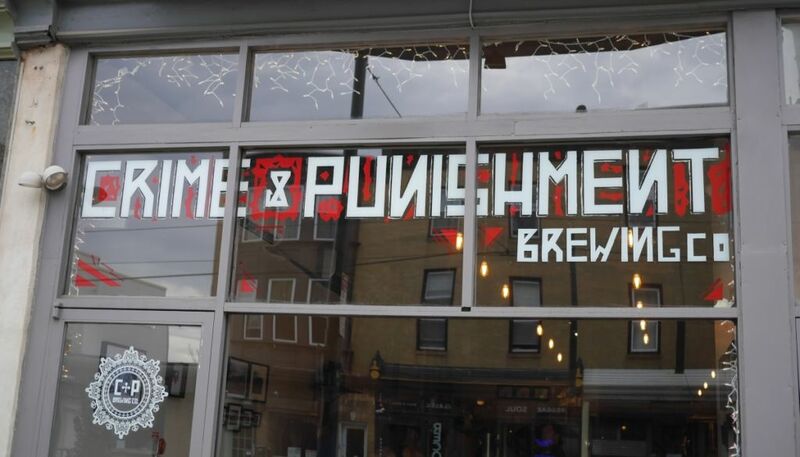 I wasn’t sure what to expect when I visited Crime and Punishment because they didn’t say much on the menu about whether the IPAs were hazy or not. I soon saw all the hazy beers everyone else was ordering and got very interested. Though first I started with their berliner weisse. Crime and Punishment is slightly north of downtown Philadelphia though a quick uber ride to get there. 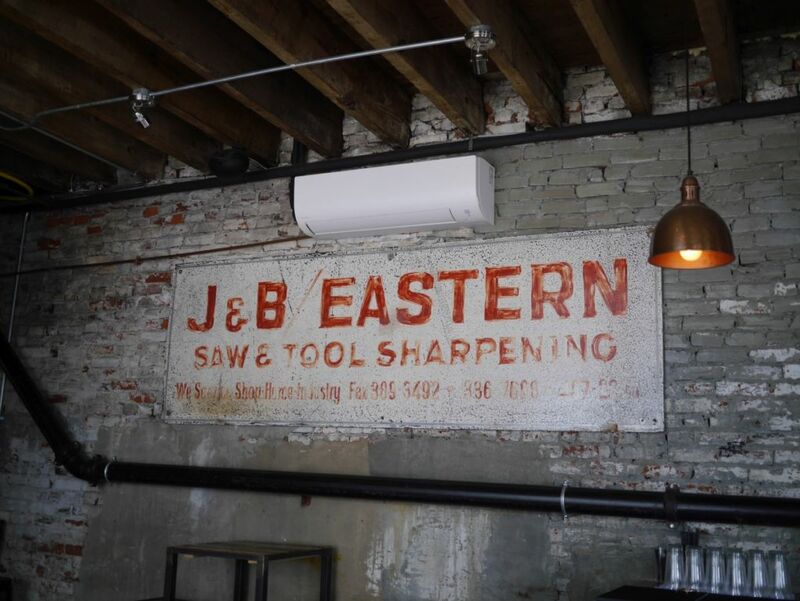 They have a large indoor space with plenty of seating and a full food menu. 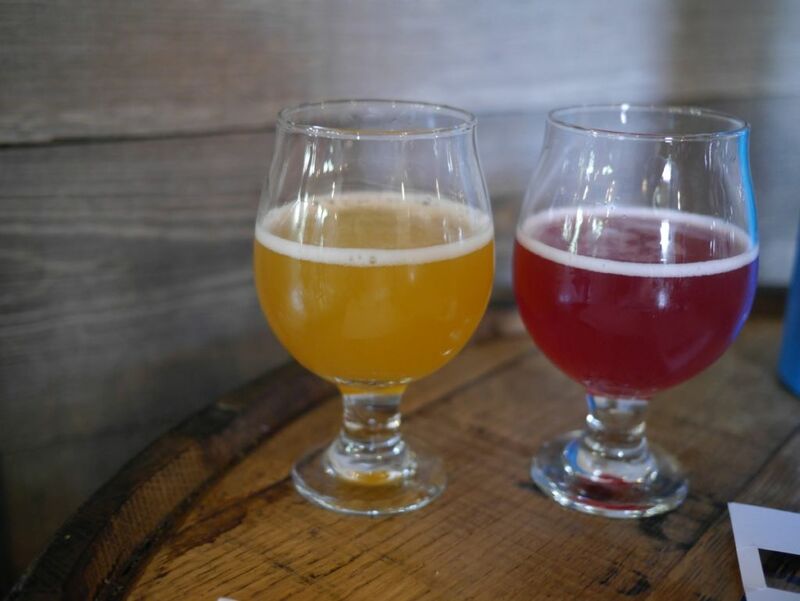 I started with the berliner weisse, which I chose over the fruited gose after tasting both. The berliner was very light in alcohol with a crisp finish and mild citrus notes. While enjoyable I could have used some more complexity or body in the beer. Space Race hazy IPA was the highlight of the visit. It was creamy and delicious with tons of fruit and citrus with mild hop acidity and a soft body. It compared well to the best I had from Monkish. Sadly the two other double IPAs didn’t have the same character. The Repeat Offender double IPA was done well but was hardly hazy at all in the modern sense. I got some herbal notes and malt sweetness but no characteristics of a hazy beer. The Visions Fugitives was hazy and soft but fairly average in the aroma department. Though it did have high hop acidity I didn’t get a lot of fruit. Since I ordered both DIPAs together I combined the two at the end and then it actually tasted like what I expected at that point. Despite the disappointing double IPAs I would still recommend visiting them because Space Race showed me they sometimes strike gold. They also had a BBA imperial stout on tap that I didn’t try because again I was ordering 10oz pours due to the pricing of the tasters. 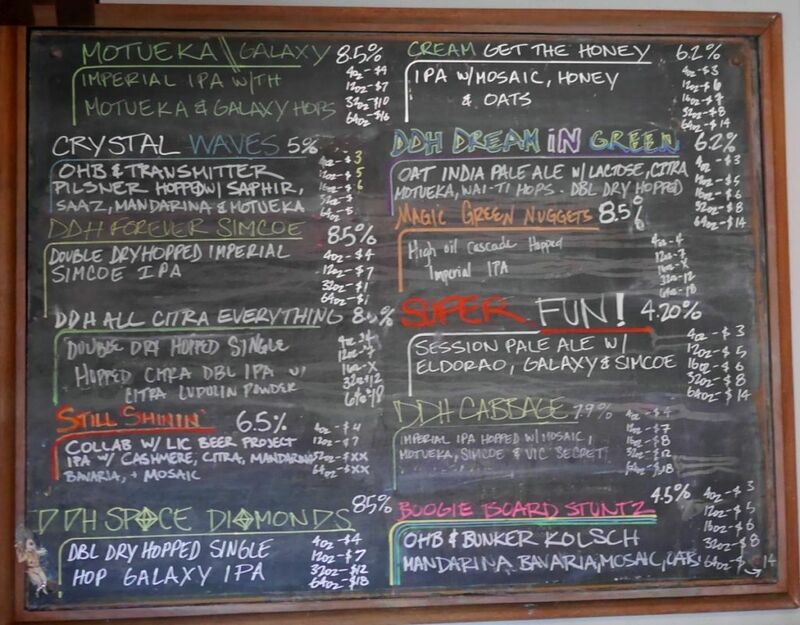 If they don’t have Space Race I recommend trying a splash of one of the IPAs before ordering. 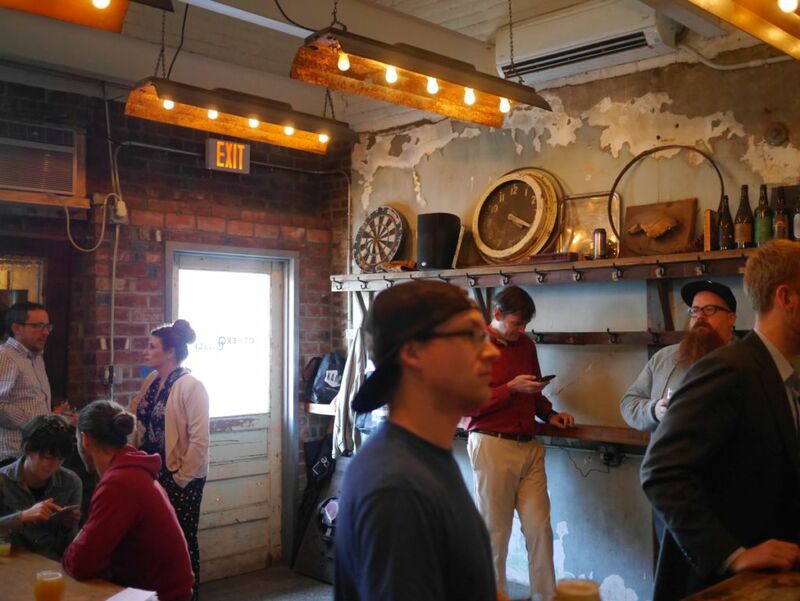 Tired Hands is located in Ardmore, a 30 minute drive or 1 hour public transit stop from Philadelphia. 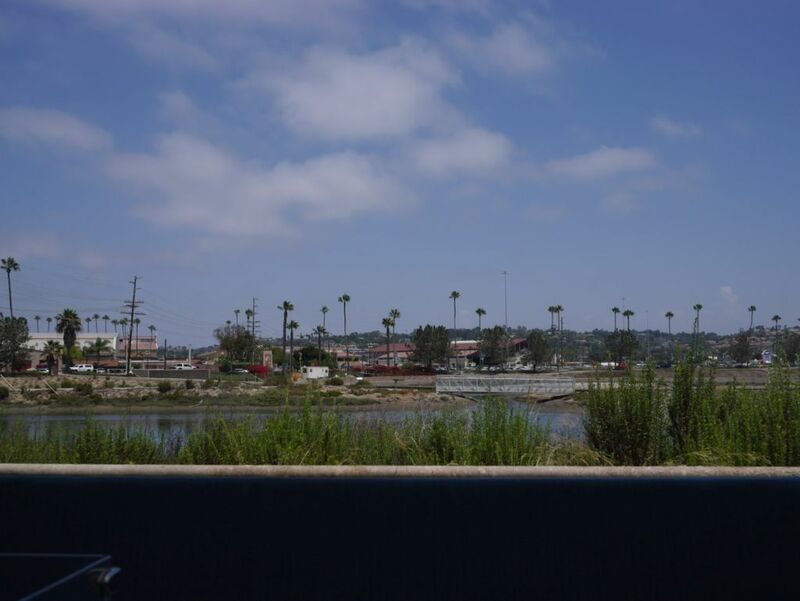 I opted to stay in the area to make it easier and I’m glad I did because I had to leave during one of my visits to take care of some work for a client for a few hours before going back. Being a short drive away made things easy. They have two locations very close to each other, the brewery and the Fermentaria (their version of a brewpub but with more fancy food). I stopped by the brewery the first night and had a couple of beers though I had the most variety at the Fermentaria as well as eating lunch. Both locations are quite loud both with the noise of people talking and the music played in the background. I started in the evening at the brewery with their cask ESB, done old school with a smooth light body and notes of caramel malts. It was even smoother thanks to being served on cask. I also tried their wacky Birthday Cake Double Milkshake, a hazy double IPA with huge amounts of adjuncts, including chocolate, vanilla, and the addition of an actual cake. They take advantage of the super soft creamy mouthfeel of their double IPAs and it works fairly well in the same way as other breweries serve white stouts with lactose and coffee. It is a super popular style but I didn’t personally care for it and I am a bit surprised I ordered a full 10 ounce pour after tasting it. 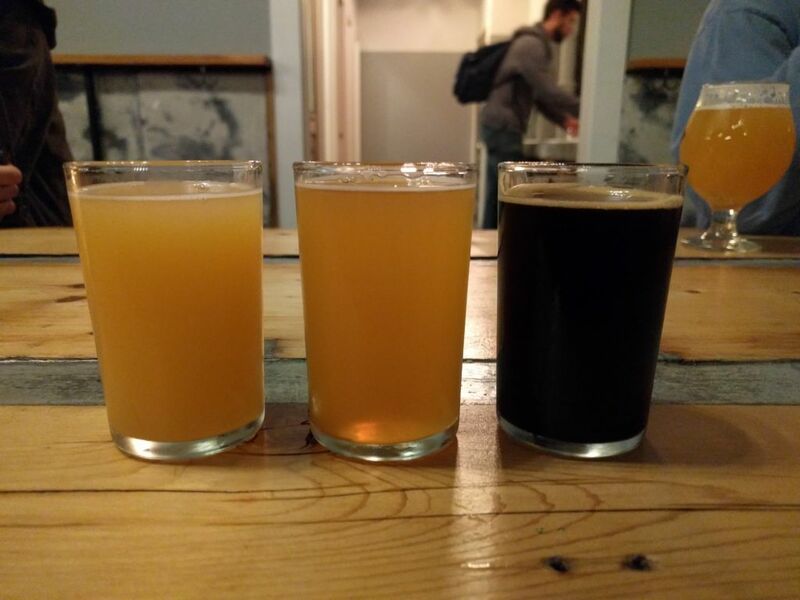 I started trying other beers at the Fermentaria the following day. Their Hop Hands, the flagship hazy pale ale, was fairly thin with notes of citrus, grass, and pine, though a bit too bitter for the style. 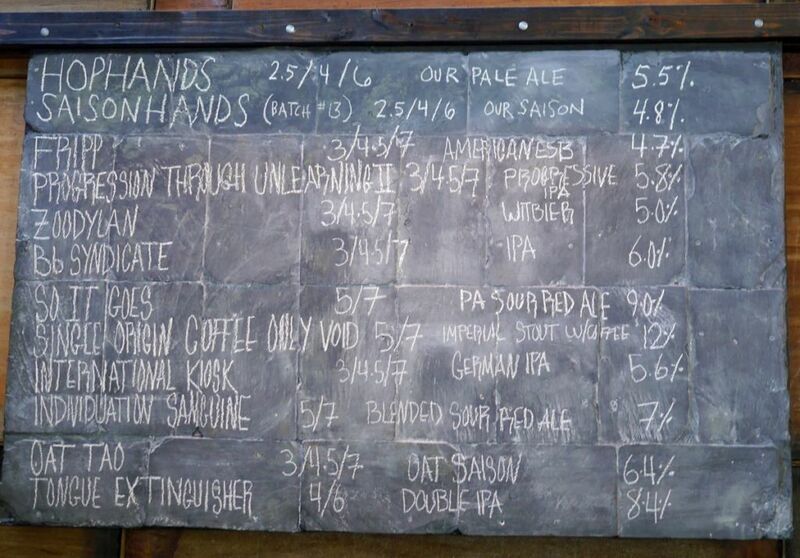 Their other flagship, Saison Hands, was delicious, a classic saison with notes of citrus and spice with a dry finish. It paired quite nicely with the Veggie Banh Mi and the hot peppers. I was so impressed by this that I later ordered a few other farmhouse ales they had. My husband ordered the Coffee Only Voyd, imperial stout with coffee, which was thick and smooth with tons of roasty coffee as you would expect from the style. 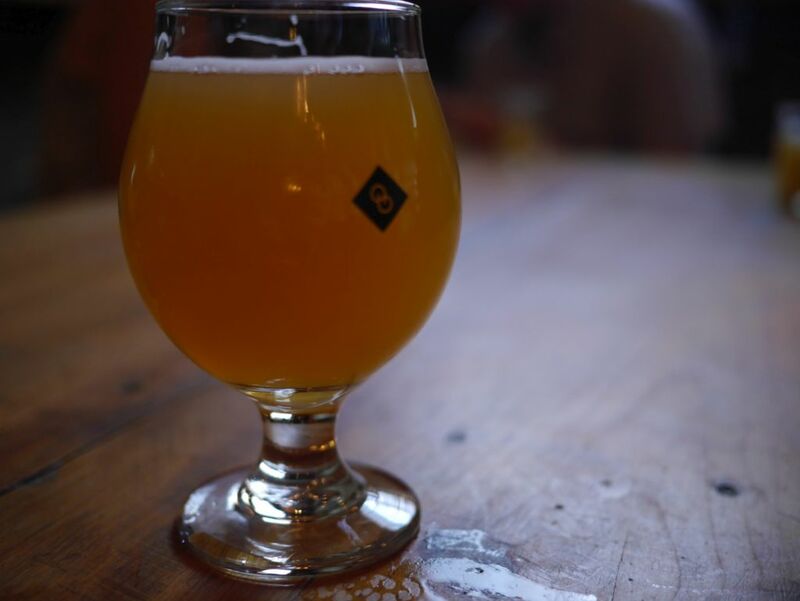 The Oat Tao, oat saison aged in barrels, had a funky barnyard nose and a soft and chewy mouthfeel. It was delightfully complex with earthy notes, mild citrus, and some green-apple lambic character. It reminded me of something similar from Hill Farmstead. 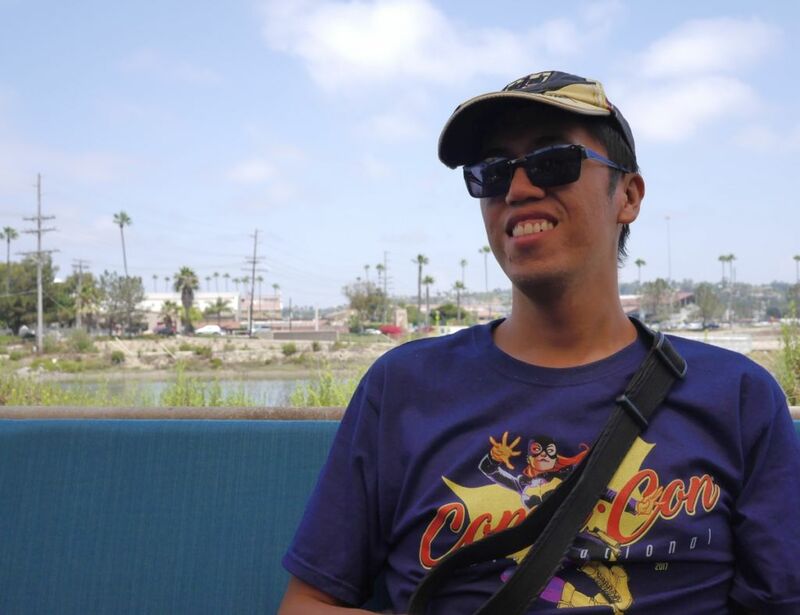 I enjoyed it so much that I ordered a pint when I finished, though many others who visited around the same time thought it was their least-favorite. 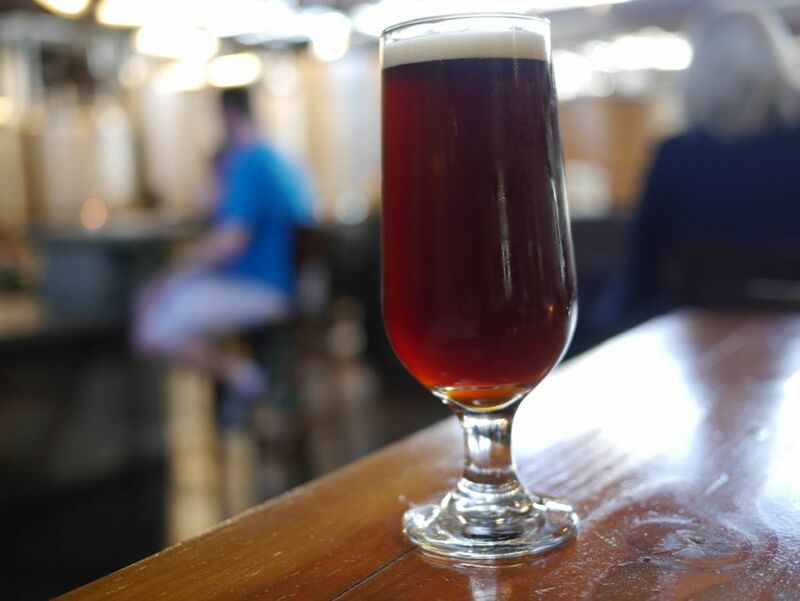 The So It Goes red sour ale was quite funky with notes of caramel, cherry malt character, and a mild tart bite. I quite enjoyed this one I think in part to the hgher alcohol which gave it an increased sweetness that kept it from being one-note. The Tongue Extinguisher hazy DIPA was soft and pillowy with tons of pineapple and grapefruit hop flavor. It had minimal bitterness, hop acidity, or alcohol bite. It was like drinking Monkish fresh from the source, and immediately I understood where all the hype for them comes from. If you go out to Tired Hands, I recommend planning to stay in Ardmore if you can. I loved he quiet area without the insane traffic of Philadelphia and one could easily spend days trying everything they have to offer. Since they price things to encourage ordering larger pours, I suggest trying a splash of a couple of beers to ensure you enjoy what you order. Not only was the beer a highlight of my trip but I can see myself returning to the area again to enjoy the slow, quiet feel of the surrounding town. I highly recommend the Fermentaria not just for beer but for their high quality food with plenty of vegetarian options to go with it. Just bring your ear plugs if you prefer a quiet brewery experience. 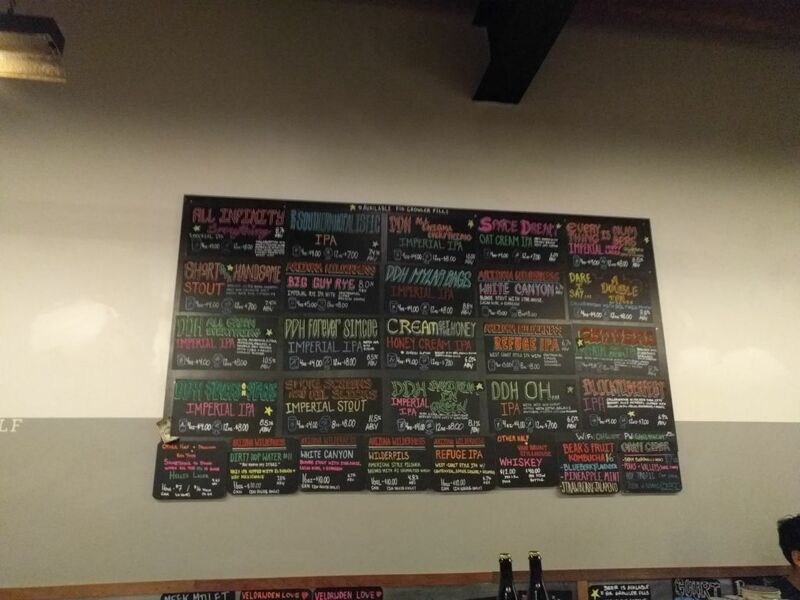 A short few months after my initial visit to Other Half they had their larger tasting room open next door and a massively larger list of beers available. I found that the IPAs were significantly better than the last time such that I would have brought cans home if it worked with my trip. Now I consider their Hazy double IPAs to be up there with Tired Hands and Trillium in flavor. I was also floored by how delicious their imperial stouts were since last time they only had IPAs. I only had three tasters in this visit because I also went to LIC Beer Project after and they don’t offer tasters. The All Infinity Everything was super creamy with notes of tropical fruit, pineapple and overall dripping with hop juice. It had a light hop acid finish and excellent drinkability for 8%. The DDH All Green Everything was 10% but tasted like 7, one of the best triple IPAs I have tasted. It was super smooth and crushable with light haze, minimal alcohol bite, and tons of tropical fruit and light grass on the finish. This one as well was dripping with hop juice. Other Half didn’t have a stout when I last visited but this time they had a bunch. I went for the biggest non-barrel aged stout on the menu with the Smoke Screens and Oil Slicks. This beer had the most flavor in a 11.5% stout that I’ve had without loading it full with adjuncts. The alcohol was hidden quite well and I got notes of cherry and light smoke with a bitter chocolate finish. The flavors balanced so well. It is a hard choice whether to drink the IPAs or stouts at Other Half now because they were both so amazing. Massive beer list at the new location. 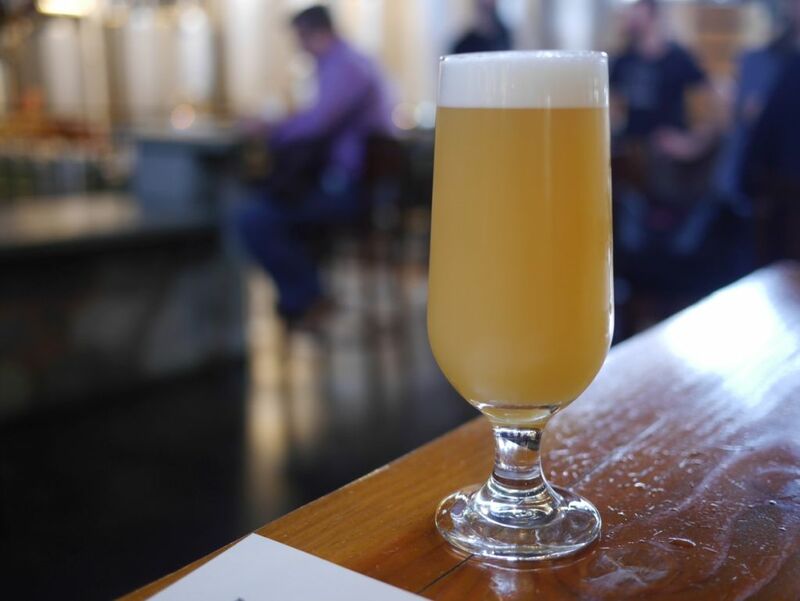 Other Half Brewing is one of the handful of breweries that has rocketed to fame, success, and trade value through their limited release hazy IPAs in cans. At the time when I visited they still had a fairly tiny tasting room near the subway stop for Smith and 9th. They offered either 5 or 10 ounce pours of most of the beers but due to the pricing I went for he 10oz pours of most of them. The beers available were almost all hop-forward and there were no sours or stouts to be seen. I tried 4 out of the total beers available because I was ordering larger pours. 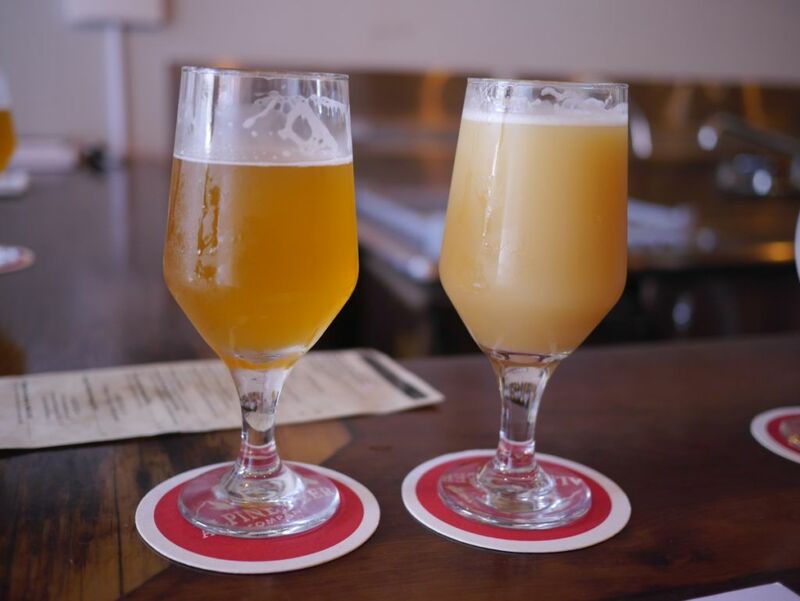 I focused on the higher ABV offerings for which they had cans available and then double IPAs because in general I find hazy double IPAs to be more flavorful than the lighter versions. The Still Shining IPA was a solid Hazy IPA with mild acidity and bitterness but not a ton of hop aroma either. It didn’t stand out from all he other hazy offerings I have had. The Citra Everything was much thicker and had a fantastic mix of citrus and mild pine with a sticky finish. I thought that the hazy double IPAs I tried could have been softer and have more hop kick but they were well done. 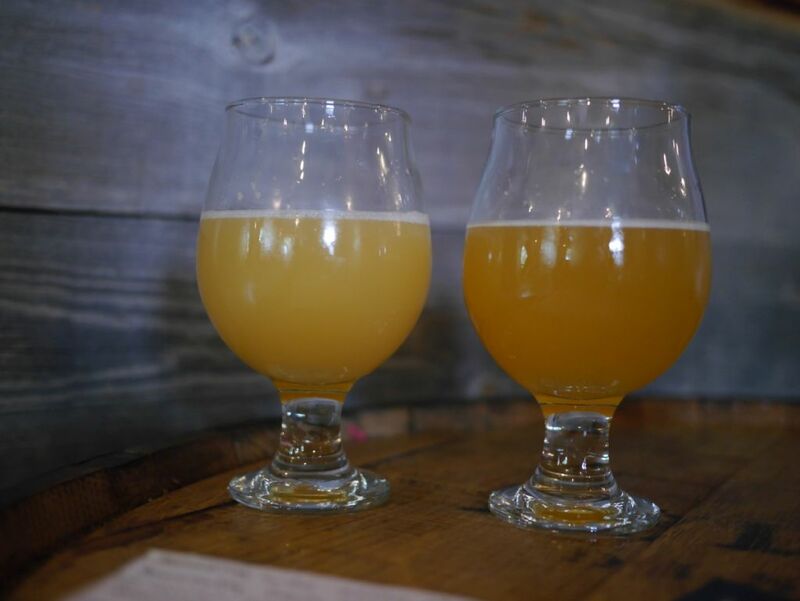 All my criticisms about these beers come from comparisons to the best of the best and my own preference for a hazy IPA because the style is not clearly defined yet officially. The galaxy-hopped double IPA, Space Diamonds, was similar to the Citra in style but flavor wise had a lot of sticky overripe papaya and citrus. The overripe fruit flavor wasn’t really my thing in part because it reminded me of a few actual experiences with overripe papaya. 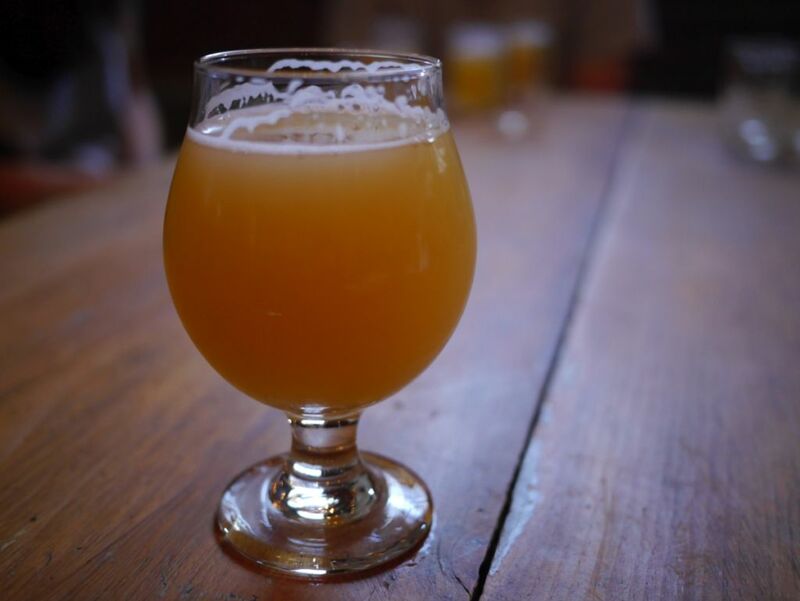 Next the Forever Simcoe was a tasty citrus-forward hazy beer without much noticeable pine. I was glad that it wasn’t like sipping a pine tree but I didn’t love it enough to get cans and think about the logistics of getting them home with our other stops still to come. Overall, I’m glad I made the trip to Other Half to try their beers. I found Tired Hands and Crime and Punishment brewing to be the most impressive though of the East-Coast hazy beers this trip with Trillium coming up behind them and Other Half after that. If a beer is sold for $20 a 4 pack I have to really be blown away by it to bring it home when so many San Diego breweries do the same style really well. When I visited, Other Half had a tiny tasting room but they are opening a larger location soon that should hopefully make for a more relaxing experience. Though I didn’t find them to be as impressive as a few others in neighboring areas, it is absolutely worth stopping by for a few tastes and some cans if you are in the New York City area. My descriptions can hopefully help you decide if this is the style of hazy IPA you like. Unlike Brooklyn Brewing, they are quite close to the nearest station, making it easy to get there. Just don’t expect to find anything other than hoppy beers and make sure you bring a cooler to keep the cans cold on the subway. Even if it is cold outside, they tend to keep the subways toasty. Also keep an eye out for a new location to open soon as I heard that is in the works too. Come to Other Half for hazy IPAs. They haven’t branched out much from the hoppy beers so this is not a stop for people who aren’t into IPAs.